I woke up this morning to a very white, white world. Yesterday we’d gotten a bit of snow overnight, but not a large accumulation, and because of warm mid-day temperatures it had already started to melt. It seems that once things cooled overnight we had some more snow push in. The trees are covered in a thick layer, and it’s still falling, making the forest on the other side of the field slightly hazy. These two days represent the first real accumulation of snow we’ve had since the Christmas storms. That’s two months of nothing but light sprinklings. Meanwhile, our friends south of the border seem to have been hit by storm after storm this winter. Sorry guys. Someone up here must’ve been offered Three Wishes. Although we hadn’t gotten to the point of seeing bare ground prior to yesterday’s snow, we had experienced a fair bit of melt, exposing some of the more well-traveled or sheltered places. We’d had a number of moderately mild days, with sustained temperatures slightly above freezing. Ducking under one of the spruces by the garden on the return from a hike one day I’d noticed an iris that seemed to have escaped the garden. It was valiantly trying to push its way up through the remains of last year’s plant and the accumulation of dead needles on the ground. It’s funny how irises and lilies seem so gullible. Wondering if there might be any other plants tricked into sprouting by the warmer weather I did a tour of the bare areas surrounding the house. I didn’t see any other green bits, but I did discover a small plastic bag by one corner of the foundation. In it were a dozen bulbs that I’d planted at the last house and then dug up and brought with me to the new one. They’d been set there when we moved in, and the garden’s vegetation quickly grew over so I’d completely forgot about them. I figured they’d all be dead, having spent the winter above ground out in the freezing cold, but had a peek in the bag anyway. Lo and behold, one was sprouting! I brought the bag inside with the intention of planting the one bulb in a pot. I think it’s a scilla, although I’ll have to wait for it to grow a bit bigger to be sure. I put the bag on the counter while I went and rummaged for a pot and soil. When I returned with the necessary implements I opened the bag and started flipping through the other bulbs to check for any other life. The second one I flipped over had this guy hiding underneath! The bag hadn’t been sealed; when I bundled up the bulbs a couple of them had mostly-dead stems still attached that I’d just closed the bag around. It appears this guy snuck in through the small opening and had cozied up there for the winter. It’s a Hemipteran, a True Bug. My first thought was that it was a leaf-footed bug like we see so many of in the house in the winter, but if it was it would’ve had to have been a nymph because it was too small for an adult. It also lacked leafy leg flanges. My next thought was that it was an assassin bug of some sort, especially given that long, strong proboscis, which assassin bugs use for piercing their prey. So I flipped open my favouritest Insect identification guide, the Kaufman guide to insects, which always has all the answers. Well, almost always. And sometimes only half the answer. But very rarely do I open it and not find something helpful. This time, it had the whole answer, and practically on the first Hemipteran page I flipped to. 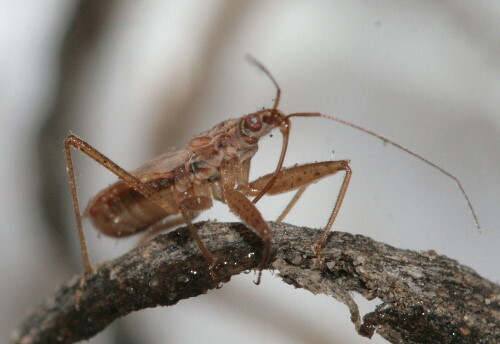 This guy’s a Damsel Bug in the genus Nabis. There are nine species in this genus in North America, nearly all found in the northeast. As I had suspected by the strong proboscis, they are predatory, feeding on other soft-bodied insects. 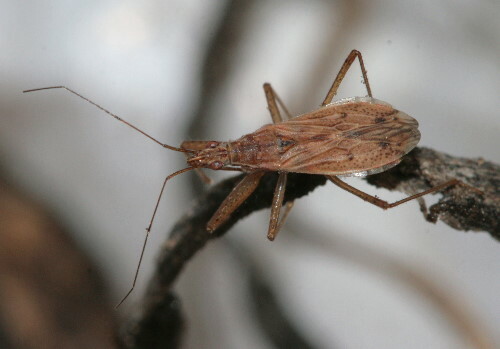 They can be told from assassin bugs by their tapered shoulders and thickened forelegs. They appear to favour fields and gardens, and overwinter as adults. Naturally, when I found the bug I didn’t have my camera. I dashed upstairs, switched out the lenses for the Macro, and hurried down to try to get a photo. When I got back, I couldn’t relocate him immediately. As I searched I discovered a few other critters crawling around in the dirty bulbs. The first one I spotted was this beetle, scurrying quickly out from under his disturbed hiding spot in an effort to find new cover. I haven’t a clue what it is, beyond being a beetle. It was tiny, less than half a centimetre (<1/4"), and a very generic, unmarked brown. I would hazard a guess at a type of leaf beetle, but, being a beetle and therefore among the most diverse group of organisms on the planet, it would be a very hazardous guess. My friend Ted over at Beetles in the Bush would undoubtedly know. Speaking of Ted and beetles, this would be a great opportunity to mention that the brand-spankin’-new blog carnival dedicated exclusively to beetles, An Inordinate Fondness, just enjoyed its inaugural edition over at the carnival’s home page. Ted put a lot of time, effort and care, and perhaps even some sweat and tears, into bringing the project to fruition, so I highly encourage anyone who loves beetles, or likes them, or is even just the tiniest smidgeon interested in them, to pop over and check it out. Then I found this arachnid. Clearly an arachnid because it’s got eight legs, it’s also clearly a harvestman because it’s got only one body segment. Harvestmen are related to but not actually spiders in the true sense. 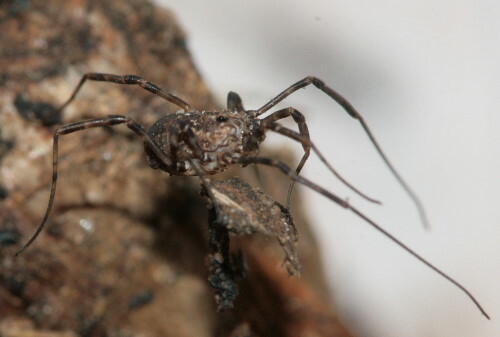 We’re mostly familiar with harvestmen as the creepy Daddy-long-legs with their spindly Tim-Burtonesque long legs. There are, however, some with long legs, some with short legs, and some with no legs at all! Okay, so not really on that last bit, but there’s definitely more diversity to harvestmen than you might initially think. There are some 6400+ species worldwide. The unifying feature is the single-segmented body. The actual identity of this individual will probably remain a mystery, though, since I lack the expertise to know what to look for, and there’s a good chance that the ID depends on some bit of microscopic anatomy, as is often the case with invertebrates. Speaking of arachnids, I also spotted this tiny little spider scurrying across the folds of the bag. 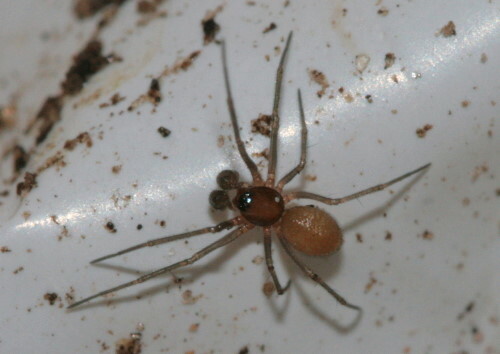 I think this is probably a dwarf spider, family Erigoninae, a group of fairly common but particularly tiny and therefore usually overlooked spiders. 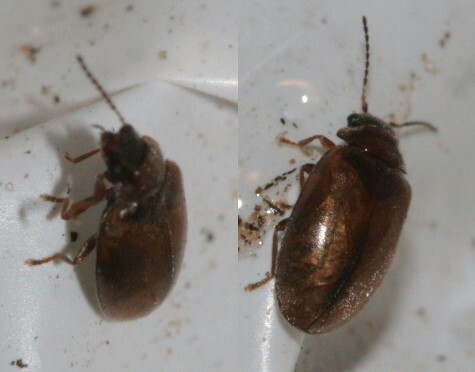 Genus is less certain, but possibly Ceraticelus. This one is a male, as you can tell by the two swollen appendages in front of its head (like big mitts, they’re primarily used in transferring packets of spermatophores to the female’s body, so females don’t have them). And finally, an inanimate addition to the collection. I don’t know cocoons very well, beyond that anything built with silk is probably a moth. The only hard-shelled cocoon like this that I’ve seen and had ID’d before were the sawfly cocoons I found under a pine tree last winter. Could this be a dipteran cocoon, then? Something else? My first thought was flea beetle (family Chrysomelidae, subfamily Alticinae), if you saw greatly enlarged hind femora that would clinch it. 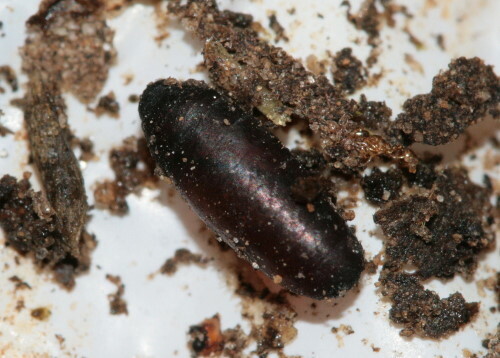 There are, however, a number of other tiny little beetles in diverse families that all converge upon this rather non-descript form. I’m inclined to think it’s a dipteran puparium (not really a cocoon, since it is the remains of the last larval instar’s skin rather than a spun silken chamber). 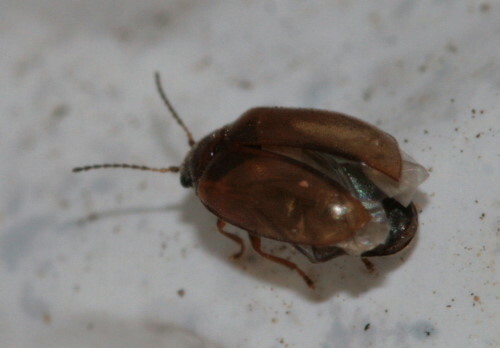 You’re right – no enlarged femora, so not a flea beetle. Still, it looks very chrysomelid-ish to me with the tarsi on all legs with the 3rd segment expanded and pad-like. On the other hand, the short pubescence on the elytra is not so chrysomelid-looking. Oh well, a bit of a mystery. So much of nature is… Though only really to us humans, with our need to categorize and label and box everything up. Presumably the beetle knows who he is. When I got to the fifth photo, I said, “Look at that nice male spider with the big palps!” And I had learned that information from my May 7 2008 entry on which you commented. Amazing which things will stick. My dad used to say, “He’s probably more afraid of you than you are of him.” Calm, jovial fathers are important to naturalists, aren’t they? Hee. It is funny how some things stick, Lavenderbay. I remember that line from my childhood, too. Amazingly, it always seemed to prove true. I was surprised to find so many, Marvin, and all alive! Makes you wonder what’s tucked into all the nooks and crannies out there.